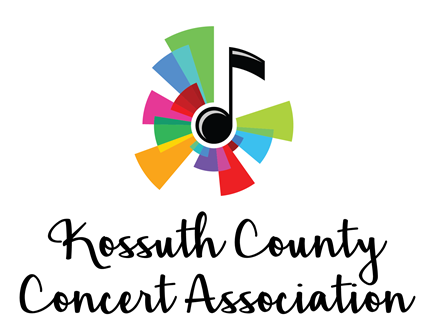 Welcome to the Kossuth County Concert Association! We invite you to explore the benefits of a concert series membership. Here you will find a schedule of all of our events and complete details about the artists, musicians, membership information, sponsorship and contact information. The Kossuth County Concert Association is an all-volunteer, non-profit organization which is committed to presenting a variety of world-class performances of exceptional musical quality, and for more than 100 years has continued to enhance the quality of life in the Algona and North Central Iowa areas. The association presents a minimum of five concerts each season in the Algona venue and has reciprocity relationships in Clear Lake Iowa, where ticketholders may attend events as well. Over the years, programming for our audiences has included classical, jazz, big bands, pop, folk, dance, comedy, vocal and instrumental soloists and groups, chorale and show bands of national and international performers. All concerts will be held in the Wilcox Performing Arts Center (860 seat theater capacity) located at 715 S Sample Street, Algona, Iowa. There are two performances for each event beginning at 2:30 p.m. and 7:00 p.m. Admittance to the concert series is by season ticket only. The cost of a single adult season membership is only $55.00, a single student membership is $10.00, and a family membership is $120.00. The excitement of live music, theater, and dance is a memorable experience that you and your family will value forever. Enjoy great live entertainment suitable for all ages without trekking to a larger city. The Kossuth County Concert Association provides big city entertainment opportunities at an amazing, unsurpassed value! Please plan to join us for an exciting Season!